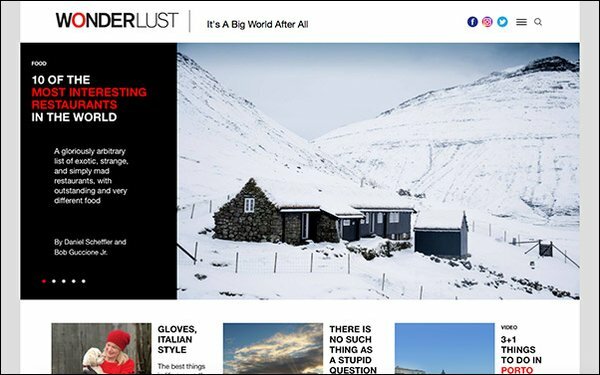 Just over a year since its launch, aspirational online travel publication Wonderlust, founded by Bob Guccione, Jr., continues to expand its offerings to readers. The latest, a partnership with travel rewards company Bonwi. Launched in 2017, Bonwi was rated the top hotel booking site by travel points guru Dan Gillaspia of uponarriving.com and was also a finalist for the Best Travel Deals Publisher award from Travolution in 2018. As part of the partnership, Bonwi will provide Wonderlust users with exclusive offers kicking back up to 40% in points when booking hotels and cars, unique registration perks and free dining across domestic bookings. There are additional savings of up to 50% off dining, shopping and entertainment. Wonderlust’s readers will benefit from the addition of having access to deals delivered by Bonwi’s stable of experienced editors, while the publication will drive a new revenue stream through commission sharing. “We expect to be able to leverage this engagement with the travel process to more marketing partnerships with travel and hospitality operators.” said Guccione. Recently, Wonderlust announced a partnership with boutique travel agency Skylark, in addition to other programs, in an attempt to focus on partnerships and ecommerce revenue for the brand, rather than relying on revenue from digital advertising. With its new endeavor, Wonderlust is following its expansion ambitions. “[The partnership] is meant to be more than the sum of its parts, to go beyond simply revenue sharing in bookings we inspire and build a community by engaging in two different universes: travel media and travel services,” said Guccione.